So What Is Time Blocking? Time blocking is simply scheduling a set time frame on your calendar with the intention and goal of completing a specific task during that time. Generally, a scheduled block of time should be between 20 to 90 minutes, which is the maximum length of time humans are able to focus on one task before losing energy necessary for completing it. During each time block there should be absolutely no multi-tasking or distractions of any sort. You need to create a totally distraction-free zone. You might think that if you just attend your meetings, answer calls, return emails, and speak with clients and employees, you’ll find the time to get all of the tasks done that have been piling up on your to-do list. But the truth is, you will never have the time if you don’t make the time. In fact, Tony Robbins said, “If you talk about it, it’s a dream. If you envision it, it is possible. If you schedule it, it is real.” Make completing all of the to-do’s on your task list a reality by time blocking them into your schedule. You need to plan exactly how you’re going to use each time block. Don’t be vague. Be specific and concise. Determine your exact intention for each time block and stick to it. Break up projects into smaller goals as needed. Time-wise, it might make more sense to break up a larger project into three 30-minute time blocks with a short break in between, depending on your energy level. Or, you could schedule a 90-minute time block to complete the entire project if you are able to focus for that length of time. No matter how long the time block is that you choose, plan out exactly what you are going to do during that time in a bit of detail. Don’t block out time for Social Media. That description is far too vague so you may find yourself spending 60 minutes perusing your friends’ walls, reading random media posts, and getting lost in the abyss of photos, videos, and articles that pique your interest. Instead, have a much clearer intention for the 60-minute time block, something like, “Create and Schedule 15 Social Media Posts Over The Next 30 Days.” Be so specific that once that block of time has ended, you will know without a doubt whether you accomplished your goal or not. Have you ever noticed that you work really well when a deadline is looming overhead? In the times you’ve waited until last minute to complete a project, have you found yourself to be more focused than usual? Parkinson’s Law says that, “Our work will expand to the time allowed.” In practice that means if you give yourself two weeks to complete a project, the project will take you no less than two weeks to complete. It also means that you’re stealing valuable hours from yourself that could be put to better use. Therefore, remember to estimate the time it will take to complete each project wisely and plan out that time accordingly through time blocking. Start small. 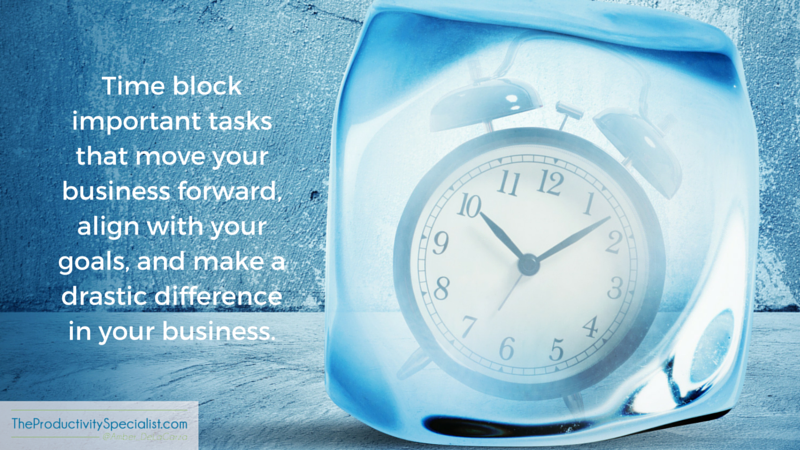 Especially if you are new to time blocking, don’t schedule any lengthy blocks of time. You would likely get distracted, which would prevent you from getting focused work done. You might even invite distractions in because your mind will be looking for a break as you will not yet have conditioned your brain to stay focused for long periods of time. You don’t become a long distance runner overnight. It’s best to start small and work your way up to longer time blocks. One method of working in shorter time blocks is to use the Pomodoro Technique which means working for 20-minute blocks with 5-minute breaks in between. The Pomodoro Technique utilizes your time in a more consistent and purposeful way. It creates systematic breaks instead of allowing random distractions to come in and destroy your concentration and work flow. You also need to obey your circadian rhythms. Everyone has an internal body clock and everyone’s is different. Some are morning people. Some are night people. Some feel most energetic right after that first cup of coffee in the morning and others feel most energetic right after lunch without the need for caffeine at all. What time of day is your energy level the highest? That is the time you should complete your best work. Most likely, the time blocks you schedule will be for completing your best work – your highest value activities. Any important task that aligns with your goals, moves your business forward, and would make a drastic difference in your business if not done can be considered one of your highest value activities. Schedule your time blocks based on your own body clock and rhythms so you have optimal energy to complete your most important tasks. When you have low energy your willpower and attention span is also low making everything look more interesting than what you have set out to do. Each time you are in the middle of working on an important task and reach over to check social media or open a new page to surf the net, that’s your lack of willpower and energy getting the best of you. Schedule time blocks to work with your natural energy levels and attention span, not against them. The ability to focus for long periods is a habit that needs to be built up over time. Much due to the digital era we live in, you have likely trained your body to work while distracted and switch back and forth between tasks all day long. Just because you train yourself how to lift weights, however, does not mean you’re doing it with the proper technique, and you may get injured. The same is true for work habits. You may think you’re doing alright, but imagine how much more you could accomplish if you were utilizing time blocking strategies that really help you get sh!t done! Start with small blocks of distraction-free, focused time then work your way up to lengthier periods of time. If you have a hard time working during your time blocks as scheduled, it is probably because you are placing more value on others’ demands of your time instead of your appointments with yourself. Hold the blocks of time you’ve scheduled to work on your high value activities just as sacred as you would a meeting with an important client. Not every meeting with a client goes as scheduled, of course, but you would never just no-show and not reschedule again. Place that kind of value on your scheduled time blocks. If you have a block of time scheduled for 10:00am and your 9:00am meeting runs late, or you get an urgent call, or something out of the ordinary happens in your business that demands your attention, you may not be able to work on your project as scheduled. That does not mean the need to work on it no longer exists. Look at your schedule and reschedule the time block for a more convenient time. Always keep that commitment to yourself and remain consistent, otherwise time blocking will not be effective. Estimating how long it will take you to complete tasks is another skill that can only be mastered over time. It takes a great deal of trial and error and experience. Perfection is not the goal but the closer you can get your estimates, the better off you will be. Over time, become aware of how you work and keep track of how long certain tasks take. You will eventually be able to determine that one kind of task takes approximately 30 minutes while 90 minutes is not nearly enough to complete another kind of task. Train yourself to better estimate the time it takes to complete each kind of task you regularly undertake. Sometimes tasks take a lot longer to complete than imagined because you either extremely underestimated the amount of time it would take or because you allowed yourself to become distracted. Eliminate every distraction within your power. Shut your phone off, maintain your closed door policy, turn off notifications, and turn off email if you’re not working in it. Take that time to strictly invest in yourself and your business. When time blocking your highest value activities, always remember to plan wisely and schedule according to your body. That means estimate the time it takes to complete tasks sensibly, be specific with your intentions, work with your energy patterns, hold your time blocks sacred, and be consistent. No one is productive all day every day. It’s just not possible, but it is possible to be productive at specific times during the day, which is why time blocking works! If you are productive just during the times you’ve blocked out each day, even if that’s only three hours total, you will be able to grow your business and get your important sh!t done!